The election may have ended two weeks ago, but it’s back to business as usual as politicians weigh-in on those crucial bread and butter issues like the environment. Earlier in the week, our President, usually more astute on global warming and its serious implications, said he’d not prioritize environment over job generation in a down economy. Two days later, a bipartisan delegation met with the President, urging he approve the Keystone pipeline, a project currently in delay mode pending rerouting to protect sensitive habitat such as Nebraska’s Sandhill Crane Sanctuary. In all of this, I have to pinch myself to see if I’m awake. I had thought Romney lost the election! I can’t speak for you, but I created Brimmings to speak out candidly, come hell or high water, on the salient issues affecting the quality of life for all of us. As for politics, I can’t say I’m overwhelmed with surprise at these Capitol happenings, given the inveterate chicanery of that sector. It’s just that I desperately want to find a window I can open to escape the foul air of political expediency bent on kicking the can down the road when it comes to the insidious challenge of climate change, a quandary that isn’t going to vanish simply by ignoring it. The debates themselves, four of them, yet not one question on the implications of global warming on public policy! I think the media just plain fell asleep at the wheel. 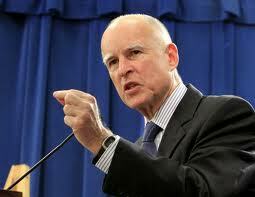 Occasionally I do find a leader such as California governor Jerry Brown, willing to open a window on a new vista. This isn’t a new thing for the governor who has spoken boldly and consistently in cadenced rhetoric on the cruciality of facing-up to this Gorgon that ultimately threatens to swallow up both Man and Beast. In August, the Brown administration launched a web site (see under Blogroll/Climate Change), replete with data to refute those denying global warming or our contribution to it. Find me another governor who’s done something like this. Find me one Senator or Rep who’s spoken out so boldly, apart from Al Gore, our should-have-been president, now vaporized from the political scene. Brown might have equivocated on green issues such as California’s cap and trade legislation, now under legal challenge by business interests in the state, but he did not, again setting him apart from the political herd. When it comes down to the bottom line, authentic leaders excel in what Vergil called Pietas, or virtue based on self-discipline. I would add ethos, or integrity, a sensibility for total commitment. I just happen to think Jerry Brown defines these leadership virtues, not just by words, but through example. This is the governor who, after all, declined residing in the governor’s mansion. And now, Mr. President, back to you, since the ball’s in your court. You’ve won a second term, which means you can focus on your place in history, joining a handful of great presidents who chose to lead and hence transform this great nation. Open a window for us, Mr. President. Stand fast. Stand tall!